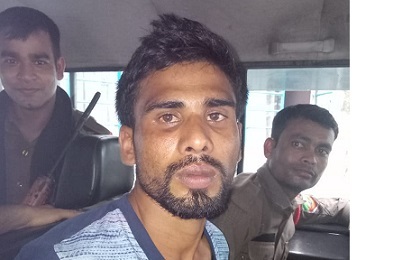 ‘Most wanted’ poacher Yakub Ali has been apprehended by forest officials of the Northern Range of the Sixth Addition Kaziranga National Park on Tuesday from Panbazar in Guwahati. Ali was allegedly the main shooter of the Sildubi rhino poaching incident in the Sixth Addition of Kaziranga National Park (KNP) at Panpur area of Sonitpur district. The poaching incident occurred on May 29, 2018. The forest officials of the Northern Range of Sixth Addition Kaziranga National Park have already apprehended a total of five poachers in connection with the May 29 poaching case. The forest officials have also unearthed involvement of poachers from both the two neighbouring States – Assam and Arunachal Pradesh – in the poaching of a rhino at Haregari Kathoni in Panpur under Sonitpur district on May 29. Ali was also involved in a rhino poaching case in 2014 regarding which charge-sheet was produced by the CBI in Guwahati. He tried to get bail in the case, but his bail application was rejected and he landed in forest officials’ net while he was roaming at Kachari area near Maghdoot Bhawan in Guwahati on Tuesday. At the time of filing of this report, the forest team along with apprehended poacher, Ali, was on the way to the Northern Range of KNP in Biswanath.